Content Notes for "Indispensable to Each Other"
These are the content notes for "Indispensable to Each Other." Note that while FEMA is an incompetent organization in local-America, the Incident Management Handbook is actually useful. Icebreakers can include questions or other activities. Trustbuilding is a process. A well-designed teamwork event will present a wide range of activities that support the stages of establishing trust. You cannot force people to trust each other, and trying to do so typically backfires. Many people have had horrible experiences with this. L-America botches this so routinely that it has become an entertainment trope. It's important to avoid mistakes that can make an event backfire. Learn how to build trust, including in an emergency. Human Knot is a classic game where a bunch of people grab hands and then try to untangle into a circle. Teambuilding equipment supports a variety of games and activities. 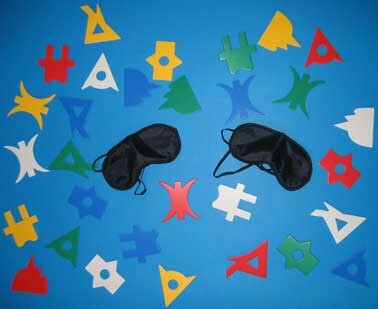 The Colourblind Communication & Team-building Kit contains colored shapes that can be used in a variety of ways. See the kit and some of its shapes. You can also make something similar by cutting shapes out of craft foam sheets. ExpressPack is a set of picture cards that may be used for discussions or games. Make your own by collecting images from magazines and catalogs or by printing out things from the internet. Pipeline Challenge involves a bunch of half-pipes and three different balls. If you want to make your own, check a home improvement store for scrap pipe -- the staff may be willing to cut them in half for you. Definitely consider adding turns or intersections for advanced play. The concept is similar to a pipe wall for toddlers, but much more challenging because you have to hold the pipes and avoid dropping the balls. The People Puzzle is a famous rope toy, but you can make one with ordinary string. Spoiler: see the solution. Teambuilding skis require people to walk together. They are easy to make, and pretty much everyone in T-America who's taken a shop class has done so. A home improvement store can usually cut and drill boards for you. Here they are in action. The fireman's carry exists in several variations. This one shows how to drape a person over both shoulders. The hard part is getting your victim up there in the first place. This video demonstrates a basic lift (and a rude joke at the end you may want to skip). Here is the more complex ranger roll that uses momentum to lift deadweight. As you can see by how the characters interact with each other, this sort of lift-and-carry exercise is pretty common in T-America for physically active professions such as police work or supervillainy. This page outlines a lot of aspects in leadership. A good event may begin with questionnaires to gauge current strengths and weaknesses. Then choose modules to attend based on those findings. Difficult people may have different qualities that make them hard to get along with. Learn the steps and tactics for dealing with them. Know how to disagree without being disagreeable. If you're in charge, and one person misbehaves and won't quit causing problems, pull them out of the room rather than let them ruin it for everyone. Box jumping is an exercise where you hop onto something. There are video and text instructions. Box jumping has a lot of benefits. There are foam or wood boxes. You can also use a step up board with risers to increase the height over time. Here are some exercises you can do with a step. Fitness games include Tap Ball and I Spy. Once again you can see that active people in T-America share a common knowledge of these and will readily suggest them during a gathering. Wheelchair workouts improve strength, stamina, and agility to empower people. These videos show safety tips, falling safely, getting down and up on mats, getting in the chair from the floor, rocking on two wheels, and spinning on two wheels. Hospitals in T-America customarily offer basic wheelchair safety and intermediate wheelchair maneuvers to everyone with the potential to learn them. Some facilities also teach advanced wheelchair stunts as a way to encourage athleticism. Supervillains who use a wheelchair quite often enjoy hotdogging around. If they had a standard risk-assessment, they wouldn't be supervillains. For disaster preparedness and emergency response, read the CERT manual and make a plan. Note that superpowers add a whole new level of complexity to this process for people in Terramagne. Miscellaneous equipment makes it easy to invent games or activities on the spot. Teamwork events need to stock a supply of suitable materials. Traffic cones make great floor markers. You can also buy a mixed set of markers. This assortment of sports equipment has some plain and some color-coded items. The soft-toss set encourages accuracy. Adaptive equipment for fun and exercise makes it easier for more people to participate. The Fun Tire is one example. T-America offers a choice of empty tires or tires filled with sand at different weights. These are really versatile because you can carry them, roll them, flip them, climb through them, step in them, and so on. EMT bags vary in weight. A civilian one may way about 15 pounds while military medic gear weighs 50-80 pounds. Paramedics are often expected to be able to team lift 200 pounds. Police standards vary, but a typical test involves lifting or dragging a dummy that weighs 125-165 pounds.